YOU deserve First Class flight tracking! 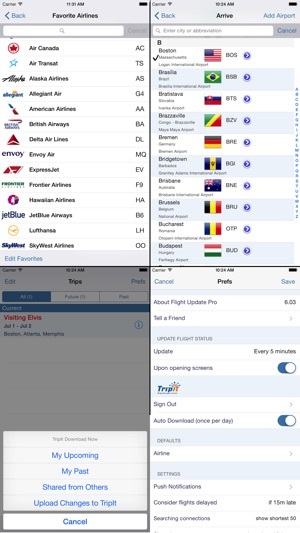 Flight Update Pro is the #1 choice of travelers and professionals to track their flights. Used by vacationers, business people and professional pilots!! Flight Update Pro uses the BEST flight status and schedule service available (rated #1 by WSJ) so you will always have the latest information about your upcoming flights. Available since 2008, it is the premier flight tracking app available on the App Store. * Automatic syncing with your TripIt account. Also, download trips shared with you by others. Upload any additions or changes too. * Follow a flight’s altitude, direction, speed and the city it is flying over. 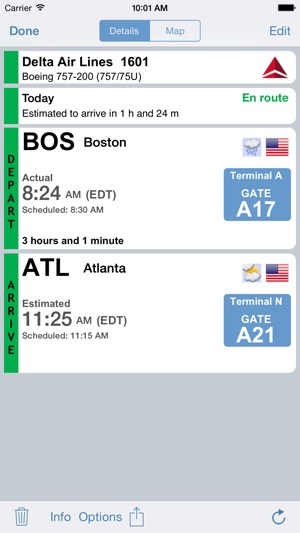 * The MOST timely notification available for flight status, gate changes PLUS pre-flight reminders! * Fully Customizable to suit your needs - choose only the reminders you want. 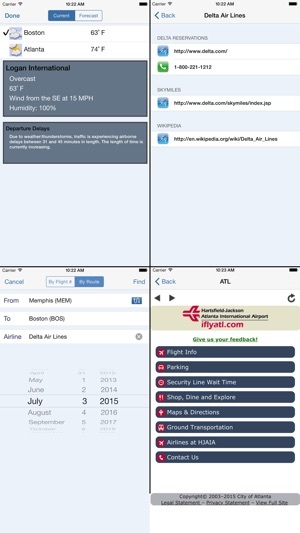 * App offers an optional monthly subscription to receive flight alerts. * Love our app? We greatly appreciate reviews. But if you are having an issue, please email us first so we can help. It is VERY likely we know about it and can suggest an easy solution. Thank you for making Flight Update Pro the top choice among travelers since 2008. * Supports new larger screen iPhones. * Fixes a bug where flights scheduled to land in one day but are delayed to land the following day do not show in the "Current" list of flights. * Fixes a bug where aircraft seating chart was wrong for some Airbus A320 flights. * Fixes a bug when on certain smaller screen iPhones the details button for airports was not visible. * Various other minor bugs. * NEW - you can now select from frequent routes when searching for "flights by route"
(screen shows a hybrid of most recent searches and frequent searches). * Fixed a bug when editing the nickname of a flight from the Detail screen. * Some other minor bugs. * Added many new airlines. * Fixes an issue where flight alerts were not enabled for existing upcoming flights IF the user restarts their subscription after it had been previously cancelled. * "View Alternates" for a flight is now available for days other than just the current day. * Fixes a bug for new subscribers of flight alerts where flights already added are not registered to receive alerts. * Fixes a bug when paging through flights (swipe right/left). DID you know that from within the Flight Details screen you can swipe right and left to switch between your flights? * Fixes a bug with the automatic download from TripIt. * Fixes issue of receiving flight alerts for flights deleted within TripIt. * Fixes a display bug showing "last update" time. * Fixes some issues with flights diverted back to gate and are then re-scheduled. 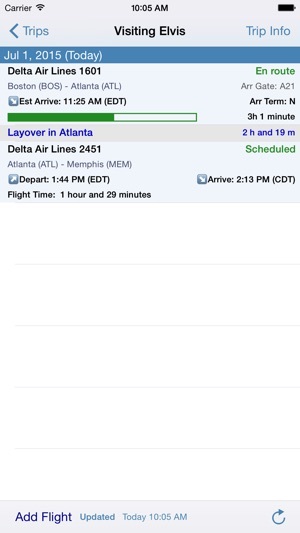 * Improved "Reload Flight Schedule" feature. * Minor user interface enhancements. * Nicknames are now included in mirrored Calendar entries. * Added JetSuiteX to airline list. * Added Thai Vietjet Air to airline list. * Fixed issue for flights not leaving from a "gate." * Fixes an issue where flights were handled incorrectly that where diverted back to its departure airport. * Other minor bug fixes reported by users. Thank you!! August 2018 - Version 7.06 - Introducing "Nicknames." Assign a "nickname" when you add a flight. That custom nickname will be displayed along with the flight. If you are tracking different people one possible use is to assign the person's name on that flight. We hope many people will enjoy this new feature. We are committed to continual enhancing Flight Update Pro. IF you like this new feature please post a review on the App Store. NOTE: If you do not have any use for "Nicknames," turn this off in the Prefs screen within the app. * Added sort by “Arrival” when searching by Route. * Added Cobaltair to the list of supported airlines. * A few minor bug fixes too. We are continually improving Flight Update Pro. We are working on other new features for future updates. Thanks to all our users who have emailed us their suggestions and feedback. As a pilot for a major airline, this is one of my daily tools. 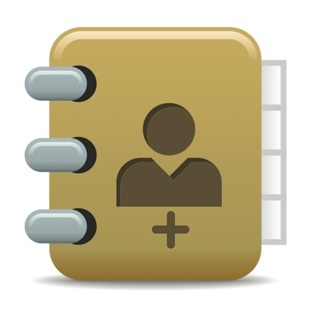 Fast, easy data entry, and easy to read info make this the best app of its kind. I fly about 10 flights every week, and it mirrors my schedule to my calendar for my family to keep up with my frequent schedule changes. Bad weather? Canceled flight? Just search for all available flights, or for a specific airline, it's all easy with this app. Even check to see when the incoming flight will arrive at your gate, or check seating charts before you book. I use it all day, every day at work (gate change notifications!). Better than any app my fellow pilots have shown me. My recommendation is to get the Pro version. For a few dollars it gives you push notifications for gate changes, etc. could save you a long walk or a missed flight. That's worth a few bucks! Update: have been using this app for a few years now. Previous versions have had a few minor glitches, but the latest version seems to have fixed everything. I'm 30 years into this airline career with one of the big 3, and this app is faster than what my own airline provides for us. It's still my go-to source for quick gate and weather info. I have over 300 separate trips in the history in this app - each one has from 1 to 4 or more days of flying. I highly recommend it for both flight crew and passengers. Was going to write long review about everything that I like and dislike about this app. But recently, it seems the data is not accurate and so therefore I really don’t need to review the app atm. I was going to email the author of the app from within the app but you can only email the author if you have an email account configured on your iPhone. (??). What I was going to say to the author is I’ve noticed that the early arrival times of flights is often not updated in the app. For example, today I arrived to Chengdu China at 5:49 AM. However your app says I arrived at 5:23 AM. 5:23 AM is incorrect. I have screenshots to illustrate my point but I am not able to submit them because I don’t use the default iOS mail application. Both UA and FlightAware report 5:49 AM. Flight Update Pro reports 5:23 AM. Another example is Norwegian Air. This data seems to be incorrect across the board. A question for the author would be, from which tables do you pull your data? And why would your data be different than what the actual carrier states is accurate? Thank you! You can absolutely email us using any email program you wish. Please go into the Prefs screen within Flight Update Pro and tap the About field. There you will find our email address which you can use. We would be very interested in seeing your screenshots which will allows us to investigate thoroughly the issue you are reporting. I know our app will display the time when the plane actually touches down. This should be displayed as "Landed." Then it should be updated later with the time it reaches the gate and show "Arrived at Gate." Is it possible the 5:23 AM time our app is reporting is the time it "touched down?" If so the app should then have updated with the "arrived at gate" time. With your screenshots we can then go back and investigate and fix any outstanding issues. Update to my review: Not only does this app continue to surpass every other one in the category, the developer is extremely fast at responding to any questions. This is a well made, well supported app. Definitely worth a full five star rating. I have used this app for a number of years now. My wife is a Fight Attendant for a major US carrier, and this app has proved invaluable for us both to track her trips. Enter the flights once into the app and have it automatically update a shared calendar and all her trips appear on both of our iPhones. Unlike other apps it also updates the calendars when trips are changed. It is easy to enter the data, easy to use and accurate. The developer has obviously paid very close attention to usability, and is extremely responsive to emails for bug reports (of which there are very few!) and even suggestions for improvement. Cannot recommend this app highly enough. Easily worth every penny.